Store your aromatic treasures in style. Our Vintage Towel Bags are a beautiful way of organizing and traveling with your aromatic treasures. Each bag is hand sewn with carefully selected, upcycled vintage towels, lined with vibrant vintage sheets, and sturdy zippers in an array of greens, pinks, blues, oranges, and purples. Small Bag fits about seven Libations. Medium Bag fits about twelve Libations. Every bag is a unique treasure, colours will be randomly picked. 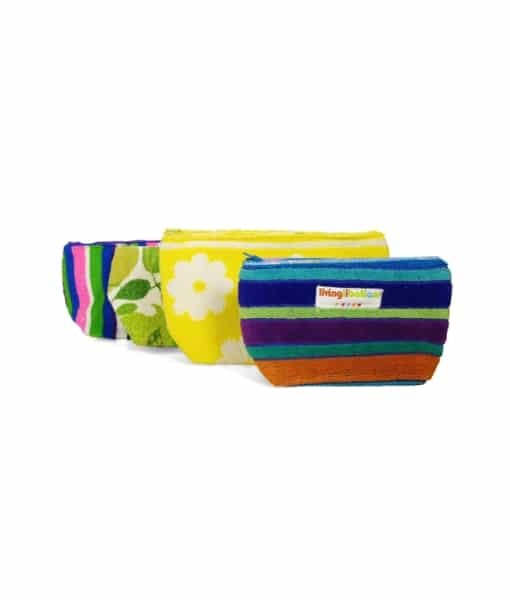 These handy dandy bags can be washed in the gentle cycle in cold water and dried on low heat when needed. I love that Living Libations is now offering to sell these on their own! I received one of these with a travel kit I bought and love it! I use it now for my beauty essentials. Very well made with a terry towel outside and a coordinating zipper and cotton inside. I am now going to be buying these as gifts!